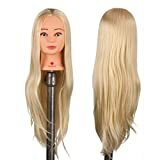 *Come with a clamp holder, which can be attached to a table to secure the mannequin head for training purposes. 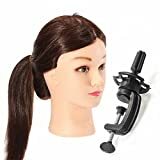 *Suitable for cosmetology students or anyone practice. 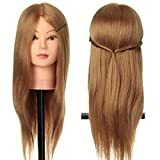 *Suitable for normal cutting, braiding, setting, etc. *The best economical way to practice and upgrade oneself. *Can not permed hair, dyed hair,and curled , dyed,straight hair. Notes:1.Please allow 3-4 cm error for the measurement data. 2.Please read the size chart carefully and choose the one suits you best before making purchase. caused by many factors.such as brightness of your monitor and light brightness. 4.Due to different producing batches, product details might be a little different. 5.If you minding the difference, please buy it carefully. 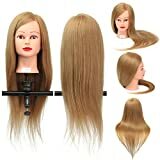 6.This hair may be difficult to comb ,so you need to use wide tooth hair comb careful to comb hair.If you want to keep the hair more smooth ,you can buy a wig`s special nursing liquid. 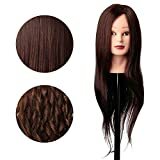 Material: 24 inches 90% Natural Human Hair – Natural Black. Suitable for hairdressing students or anyone to practice straighten, curl, cutting, braiding, setting; Not suitable for marcel and dyeing. Not suit for dyed, marcel and rinsing. Do not blow hot over 80 degree temperature on the hair. 1.Please allow 3-4 cm error for the measurement data. 3.The real color of the item may be slightly different from the pictures shown on website caused by many factors.